I’m sorry, they did what? 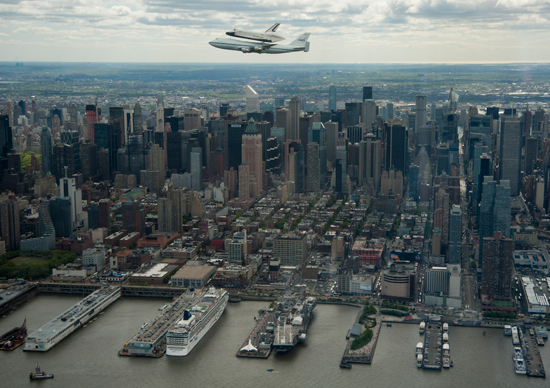 The space shuttle, Enterprise, on what was supposed to be literally its last voyage has quite literally barged into a railway bridge abutment, which resulted in a nice-sized ding in the historic aircraft’s right wingtip. 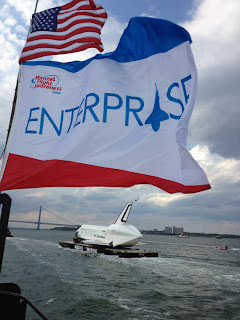 Enterprise, a NASA aircraft used for testing but never actually flown on a space mission, was being moved by water from Kennedy International Airport on Sunday June 3. 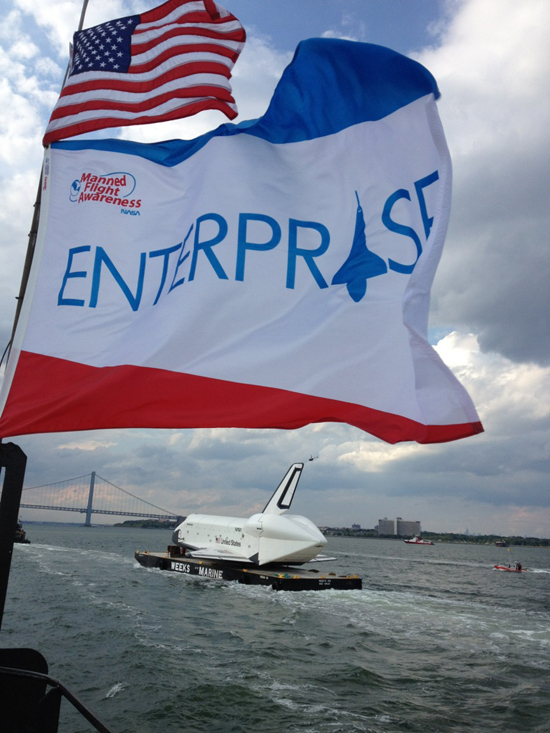 Enterprise had been loaded onto a barge for the first of a two-step process to get it to the Intrepid Air and Space Museum in NewYork. It was all smiles to the bystanders on the shore and poses for the camera until it came time to maneuver the 78 foot wide shuttle through two narrow bridge abutments. Dennis Jenkins, who was on the barge sent an email to collectSpace.com,explaining that passing through the openings “presented challenges,” because there was only a few feet of clearance on either side of the shuttle’s wingtips and the vertical clearance for the 57 foot vertical stabilizer was also tight. "Mother Nature did not smile on us. Just as the barge entered the railroad bridge, the wind caught it and pushed the right wing into the bridge abutment. Fortunately, the damage seems to be cosmetic, limited to the foam that covered the wingtip. 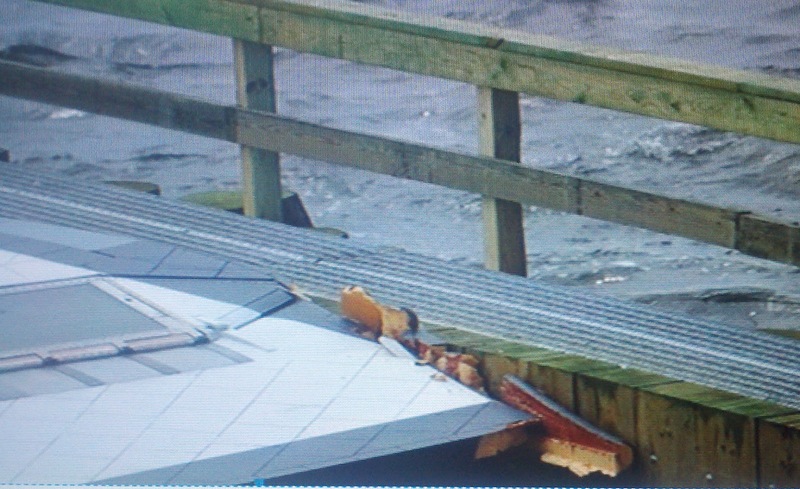 No structure or mechanisms appear to have been damaged," Jenkins wrote to collectSpace.com. Ouch! Jenkins can claim it is only cosmetic. He may even be right. After all, the shuttle is not going to need a working wing, any more than the aircraft carrier, Intrepid, now an air museum, needs a working catapult. But the prestige of all involved has sure been given a good whack, especially when you consider this is the second museum quality airplane that came to New York in one piece only to wind up in several before ever reaching the shores of the Hudson. Four years ago, the British Airways Concorde, which had been on display in Brooklyn while awaiting the completion of a renovation of the Intrepid, had its distinctive nose cone shorn off when a truck ran into it. You can read the full New York Times story on that event, here. As you can imagine, British Airways was none too pleased. 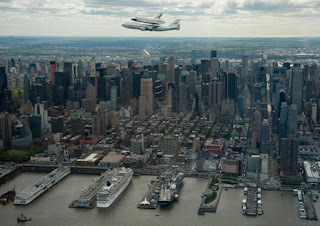 Considering that the competition for the three retired shuttles was fierce and that feelings are still raw in Dayton, Houston and Seattle – where famed aerospace institutions did not get to claim one - I’m just glad I’m on the otherside of the world far, far away from New York. From here, I can’t hear what is being said about our ability to care for precious pieces of aviation history, but I'm guessing there are three U.S. cities with a good idea of what they'd do with a working catapult and the folks responsible for Sunday's whole sorry enterprise. Thanks to Zach Naimon for his help in publishing this post while I am in China.